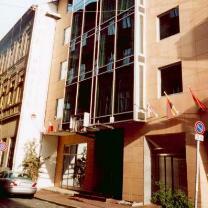 4-star hotel in the 7th district of Budapest. Address: 1077 Budapest, Kisdiofa u. 13. The recently refurbished Hotel Ambra offers 37 rooms and is located in the heart of downtown Budapest on Kis Diofa utca, a cobblestoned street off Kiraly utca and close to Liszt Ferenc tér. The newly refurbished Hotel Ambra**** offers 37 rooms and is located in the heart of downtown Budapest on Kis Diofa Utca, a cobblestoned street off Kiraly Utca and close to Liszt Ferenc Tér. Cosmopilitan Budapest offers many restaurants - from traditional to modern - meeting the tastes of everyone - including the fine dishes of spicy and delicious Hungarian cuisine. At night the many new, modern bars and pubs attract guests for refreshing dinks accompanied by wide spectrum of music; dynamic dance clubs are all around the city - open until dawn. Many of these bars and restaurants can be found on Liszt Ferenc Tér, only 5 minutes walking distance from Hotel Ambra. Liszt Ferenc Tér has become a centre of entertainment for the city - great restaurants and bars, most of which have a terrace for the hot summer evening. Kiraly Utca is an ideal place for shopping - pieces of art, hand made clothes, trendy house items from trendy design shops that line this attractive street - many fresh ideas to treat yourself or to surprise a loved one. 37 recently renovated rooms offer 4 star accommodation with boutique feeling - Comfortable queen size beds, large windows, intimate lighting, modern interior design, spacious bathrooms with shower and hairdryer, Internet access, satellite TV and minibars. After a long day in the city you will be more than happy to relax in the comfort of these new rooms. Our full hot and cold buffet breakfast offers large variety of fine meats, bakery, cereals, fruits, vegetables, cheeses and other diary products, omlettes and juices. Next to the lobby, our bar is open day and night. The various types of hot and cold drinks and the special, selected quality wines may be a perfect start or a calming finish of a wonderful night in the city. The hotel has its own underground garage. All rooms are opened and closed with electronic key card. The hotel is fully air-conditioned, and the temperature can be adjusted individually in the guestrooms. Safe desposit boxes are available free of charge at the reception. The hotel allows pets, but for an additoinal fee. Guestrooms and all common areas are accessible for wheelchairs; however we have no special room for disabled guests. Two non-allergic rooms with non-allergic bedding, and without carpeting are available. More than half of our rooms are designated as being non smoking. One child under 12 can share a room with parents free of charge on an extra bed in a standard room. From each highway follow signs towards the city center or "Centrum". From Deák Ferenc Tér go onto Andrássy Utca and drive straight until Oktogon. Turn right to Erzsébet Körút (boulevard) and then take the second turning to the right onto Király Utca. Continue on Kiraly Utca until Kazinczy Utca; then turn to the left. Take the first street left again (Dob Utca) and the next left again (Kis Diófa Utca). From the airport you can take a taxi (approximately 5500 HUF (22 EUR)) or the airport minibus transfer for 2300 HUF (11 EUR) per person. If using a taxi we suggest that you clarify the cost with the driver before starting; if you take Zona Taxi, the official airport taxi - the price should be fixed. If you decide to take a minibus, this can be arranged at the dedicated minibus desk inside the airport. Aiport Bus stops in front of the entrances of both terminals (line #200). It takes you to the end station (Köbánya-Kispest) where you can find the Metro station - a yellow building with escalator. You take the metro M3 (which is the only line that runs there) to Deák Ferenc Tér. From the metro station take the exit toward Király Utca. Walk along Király Utca until you get to Kis Diófa Utca and turn right there. The second building from the corner is Hotel Ambra. Follow the signs towards city center or centrum until you reach the downtown at Kálvin Tér. Turn right at Kálvin Tér on to Múzeum Körút (boulvard) and drive straight to Deák Ferenc Tér where you should turn right onto Andrássy Út. Drive straight until Oktogon and turn right into Erzsébet Körút. Take the second right onto Király Utca and drive straight until Kazincy Utca. Turn left onto Kazincy Utca, then a left again at the first street onto Dob Utca and a left again from Dob Utca on the first corner into Kis Diófa street. At each train station you can take a taxi which should not cost more than 5000 HUF (20 EUR) from any of the stations. We suggest that you clarify the cost before getting into the car. Take the metro M2 toward the end station Déli Pu. and get off at Deák Ferenc Tér. Take the exit from the underground station toward Király Utca and turn into Király Utca. Walk straight until Kis Diófa Utca and turn right into the street. The second building from the corner is Hotel Ambra. Take the metro M2 toward the end station Örs Vezér Tere and get off at Deák Ferenc Tér. Take the exit from the underground station toward Király Utca and turn into Király Utca. Walk straight until Kis Diófa Utca and turn right into the street. The second building from the corner is Hotel Ambra. Take the metro M3 toward the end station Köbánya-Kispest. and get off at Deák Ferenc Tér. Take the exit from the underground station toward Király Utca and turn into Király Utca. Walk straight until Kis Diófa Utca and turn right into the street. The second building from the corner is Hotel Ambra.